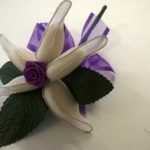 handmade 5 petal almond flowers with dark cadbury purple rose and dark purple ribbon bow. 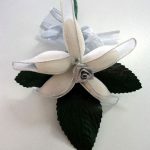 Hand-made white sugar coated almond flowers with silver ribbon and silver silk flower in centre and deep green silk leaves. Approximate length 14cm x 8cm wide (at widest point). 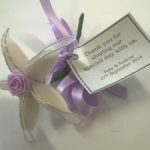 Ribbons can be chosen in your choice as well as flower colour in centre. A novel idea as the meaning behind 5 almonds for the Bride and Groom is – Health, Wealth, Children, Happiness and Long Life. Traditional 5 almonds in weddings mean health, wealth, children, happiness and long life. 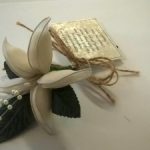 These handmade cute flowers are a novel idea to keep this tradition, comes complete with a tag with your choice of words. Silver leaf almond flowers for the glittery look. 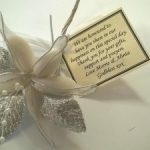 With silver ribbon bow to compliment. 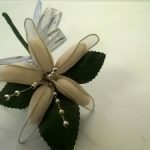 Our handmade almond flowers with 5 almond petals and silver pearls and silver bows. Vintage inspired almond flowers with 5 edible almond encased in the petals. Comes complete with a printed tag.